the mincemeat mixture to the ice cream and mix. roll into a 8cm-thick cylinder about 30cm long, and refreeze for 24 hours. 3 Arrange the sponge on a plate (it needs to measure about 30 x 8cm). Warm the stock syrup with 40ml of the dark rum and pour over the sponge to soak it. ice cream. 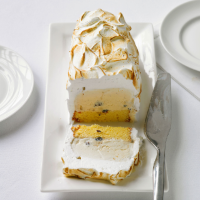 Lay the ice cream on the sponge, then carefully, with a large palette knife, cover with meringue. 5 Blow torch the meringue until golden. Warm the remaining rum, ignite and pour over the Alaska. Serve! To make stock syrup heat equal quantities of sugar and water until boiling, then allow to cool completely.